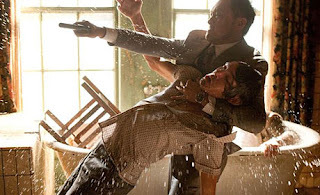 Christopher Nolan's highly anticipated film Inception delivers on all levels. The writer/director of “Memento” and the last two Batman films continues to show us that action blockbuster goers don't have to check their brains at the door. Lots of directors can blow stuff up well; but Nolan blows stuff up with intelligence. I’ve been following this movie ever since I heard about it last summer. I was afraid all the hype surrounding it would cause disappointment. But it's DiCaprio and Nolan - they rarely disappoint. This film was no exception. It superseded all my expectations. The plot, the music, the writing, the acting, the cast, the special effects… all brilliant! 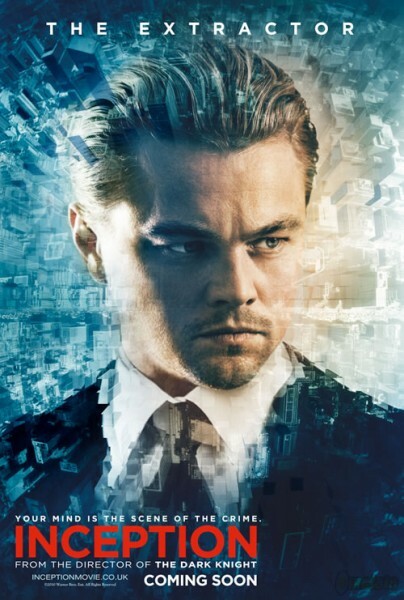 The Plot: Leonardo DiCaprio is Cobb, a professional corporate spy who steals information by infiltrating dreams. When a wealthy exec (Ken Watanabe) makes him an offer he can't refuse, Cobb pulls a team together for one last job. There's Arthur (Joseph Gordon-Levitt), his Point Man. Ariadne (Ellen Page), the Architect and the new recruit, Eames (Tom Hardy), the Forger and Yusuf (Dileep Rao), The Chemist. Together, the expert crew attempts a heist of epic proportions. As the dreams build upon each other and Cobb’s past creeps through, Nolan has us just where he wants us — deliriously lost in a world where dreams and reality are indecipherable, and it makes us curious enough to stand in line for another showing. Anyone who knows me is aware of the crazy, intense, intricate dreams I can have, so the idea of this film definitely intrigued me right off the bat. I love how Nolan took one basic concept and transformed it into a well crafted, intelligent piece of brilliance. The simplicity of this film is undeniably beautiful. It's complex and riveting and it definitely keeps you captivated for 2 1/2 hours. If you haven't seen this movie yet... what are you waiting for?! yay! so good! a good summer movie finally!!! I even loved Ell-ien Paige! I never love her!! not a hard critique to write up eh! Also I'll take two more Joseph Gordon-Levitt's to go please. I concur! This movie was about smarts. The writing is something that is seriously lacking is many summer movies (and nearly all movies this year). Nolan takes you on a thrill ride of intensity. What's even better, is you have no idea what's going to happen next!